Jaron Robinson had done this before. When he was in high school he hit a walk off home run. Friday night after Colton Onstott ripped a double to left center, Robinson knew he had to produce. He had received the night off as he had been playing shortstop nearly every night. He got a pitched to hit and deposited it over the left field wall for a two run walk off home run. Liberal had defeated Great Bend 3-2 and a celebration ensued. The Bee Jays scuffled offensively most of the night. Liberal only had four hits and two came in the decisive ninth. The Bat Cats scored runs in the second and third innings to lead 2-0. Darren Cook pitched the first four innings. Tyler Tognarine was a key contributor to this win as he pitched five scoreless innings for the win. Liberal scratched across a run in the bottom of the sixth when Garrett Scott singled, Gage Teer reached on an error, and Kyle Schmidt lofted a sacrifice fly to right. Scott’s single in the sixth was the first BJ hit of the night against Great Bend lefty Jarrett Seaton. In the ninth, two pinch hitters won the game. Onstott doubled and then Robinson homered. Liberal wins the fifth straight and is 8-3 in the Jayhawk. Great Bend, a brand new team, is 5-7 in the Jayhawk. 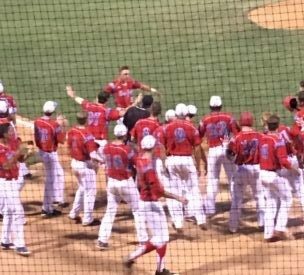 The same two teams play Saturday night at 7 with the Dugout Show at 6:45 on 1270 and kscbnews.net. Candi Prater Farmers Insurance is the buyout sponsor. They will give away 250 Meisenheimer’s Barbecue sandwiches, chips, and a drink to the first 250 fans. She will have farmers gift bags for the first 250 families, Children’s drawings for autographed baseballs and fidget spinners. Adult drawings for chamber gift certificates. The BJ’s also host their free youth clinic Saturday morning from 10-12 for boys and girls at Brent Gould Field.